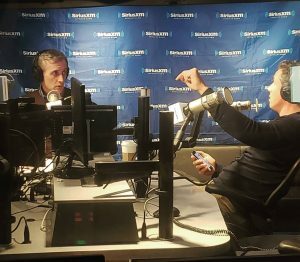 The Dan Abrams Show: Where Politics Meets The Law premiered on Monday on SiriusXM. The radio show began with the tragic events of the weekend. Nestled in the middle of a predominantly Jewish community, The Tree of Life synagogue in Pittsburgh, PA opened their doors to Saturday worshipers and visitors for a baby naming ceremony. Eleven people were killed in a 20-minute attack on the synagogue. Police were called to the scene just before 10:00am. Robert Bowers, a 46-year-old long-haul trucker with an affinity for posting anti-semitic content on social media, was arrested and faces 29 federal crimes. He appeared in court where prosecutors announced they will be pursuing the death penalty. Following Dan’s appearance last week on Chris Cuomo’s show Let’s Get After It, the CNN anchor and radio show host appeared on the premiere episode of Dan’s show. Dan also invited Daniel Goldman, NBC News/MSNBC Legal Analyst and Fellow of Brennan Center for Justice at NYU School of Law. The conversation started with discussion on capital punishment, its viability, and the personal beliefs of host, guests, and callers. In the press release, Sirius said that “with so much of today’s breaking political news having a legal component, Abrams will delve into the issues with a team of specialists, including former federal prosecutors and other high-profile experts.” With Monday’s episode fulfilling these promises, The Dan Abrams Show will undoubtedly deliver compelling, important content to news consumers looking to understand the biggest news stories of the day from a legal perspective. The Dan Abrams Show: Where Politics Meets The Law will air every weekday from 2:00-3:00pm on SiriusXM POTUS Channel 124.